Offers hassle-free, space-saving storage for CPUs. 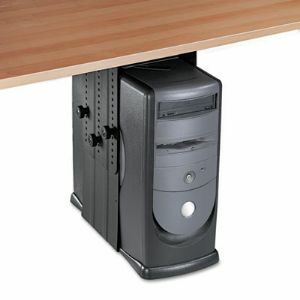 Protective unit mounts underneath workstation to shield CPU from dirt, dust, bumps or accidental spills. Adjusts to fit CPUs 3 1/4" to 9" wide and 10 1/2" to 18" tall. For quick, easy access to cables and ports, the CPU holder rotates a full 360° or slides out from under your desk using the easy-grip handle, then slides back out of sight on the smooth 16" track. Powder coated steel for strength and durability. 100% Recyclable.